Accommodations: Attendees are responsible for their own meals and accommodations; packing a lunch each day is recommended Several lodging options are available in the Marquette area. Course Materials: Participants will be provided a copy of the USDA NRCS Field Indicators of Hydric Soils in the United States, A Guide for Identifying and Delineating Hydric Soils, Version 8.1, 2017. Class Description: Two day field class covering hydric soil identification in a variety of wetland and transitional habitats. Participants will learn through a combination of in-depth classroom instruction, lab exercises, and field study how to identify and properly describe organic, sandy, and fine textured hydric soils using the Field Indicators of Hydric Soils. 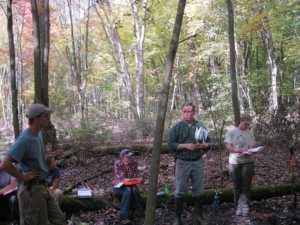 The class will visit field sites in the Marquette area. Participants should be prepared to work outside in cool and potentially rainy weather. This is a field course, participants should be prepared for varying field and weather conditions (rain gear, sunscreen, bug spray, etc.). Instructor Bio: James Sallee is a Certified Professional Soil Scientist with over 20 years of experience working in Michigan’s wetlands. James currently works as a wetland consultant conducting wetland delineations and hydric soil reviews throughout Michigan. James led a research project on difficult hydric soils of Michigan that resulted in additional hydric soil indicators being developed and included in U.S. Army Corps of Engineers supplements. James also spent several years as the DEQ’s Wetland Specialist focusing on hydric soil identification. James has testified as a hydric soil expert in various administrative, criminal, and civil court cases. James also participated in the National Wetland Condition Assessment. Class Cancellation Notification: Five (5) days prior to the start of class, participants will be notified of a cancellation. The MWA Treasurer will refund 100% of the fee received to participants.